When the Java ME version of the Opera Mini Browser is running on many touch screen phones, an unnecessary virtual keypad appears at the bottom of the screen (image above left). The keypad wastes space, looks ugly and isn’t needed with touch aware apps like Opera Mini. The keypad is not part of Opera Mini. It’s something your phone adds because it doesn’t recognize that Opera Mini is optimized for touch. There are several ways to get rid of the virtual keypad so your Opera Mini looks like the right hand image above. Some phones have a menu option for getting rid of the keypad. I’ve only seen it on Samsungs but it may be an option on other brands as well. 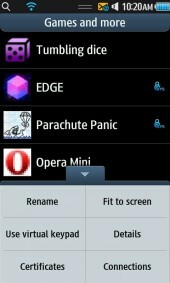 Open the folder or menu where you launch Opera Mini. On my Samsung Wave it’s called “Games and more“. Look for and tap a button named “Options“, “Menu” or something similar or has an icon that looks like a menu, stack of papers or three dots. On the Wave it’s the middle button with the three dots in the left hand screenshot below. If your phone doesn’t have a menu option to remove the keypad continue reading to see if Opera Mini has a fix for your phone. II. By using an official version of Mini customized for your phone to remove the virtual keypad. If Opera recognizes and officially supports your phone it should deliver a modified version of Opera Mini that has code telling your phone to remove the keypad. Opera can only recognize your phone if you download Mini from m.opera.com using the phone’s built-in browser. If you download Opera Mini from an unofficial source or downloaded it with your PC and copied to the phone using Bluetooth or a cable you have a generic version that’s not optimized for your phone. If you download Mini from m.opera.com with your phone’s built-in browser and you still get the virtual keypad, let Opera know so they can fix it in a future release. File a bug report at mini.bugs.opera.com. Also visit m.opera.com/detect with your phone’s built-in browser and fill in the form listing the phone make and model. If you still have the virtual keypad after downloading from m.opera.com with your phone browser and you don’t want to wait for Opera to get around to fixing it, which can take months, it’s easy to fix it yourself. Read on for instructions. You will need a PC, some patience and the ability to follow directions to modify Opera Mini. If you lack any of those or want someone else to do the work, skip to the end of this post for a link to an already modified version of Opera Mini. The trouble with unsigned apps is that on most phones you will get annoying pop-up messages asking you to allow Opera Mini to connect. On some phones you only get one pop-up when you first start Opera Mini but on others you get pop-ups every time you click a link which makes Opera Mini almost unusable. A few phones won’t allow unsigned apps to connect at all. Opera will only let you download the signed versions of Opera Mini using a mobile browser. So to download the signed jad file to a PC we have to fool the Opera site into thinking we are using a mobile browser. The easiest way to do that is with the Firefox browser and the User Agent Switcher extension. In the User Agent field, enter you phone’s built-in browser’s user agent. You can find it by visiting ua.yeswap.com with the phone browser which lets you email your browser’s user agent and other headers to yourself. Blank out all the other fields, press the OK button to save. Upload the file to Dropbox.com or another file sharing service that is easy to use in your phone browser. Click here to get a free 2GB Dropbox account (by using this referral link I get an extra 250 MB of storage in my Dropbox which I thank you for). Visit Dropbox with your phone browser and click the modified mini.jad link to download it on your phone. Update 6-Apr-2014: The certificates have expired on all the files below. It’s not possible for me to update the certificates on these files. They will give an error installing. On some phones it may be possible to install these apps by temporarily setting the phone’s date back to 2/1/2013 or earlier. After the app installs you can (and should) set the phone’s date back to the current date and the app will still work. Updated 20-Sept-2012: If you get out of memory errors installing Opera Mini 7, here’s the smaller but less capable Opera Mini 4.4. Click any of the above links in your phone browser to install Opera Mini 4.4, 4.5 or 7.0, 7.1 or 8.0 with the virtual keypad disabled. This entry was posted in Opera Mini Tips and Tricks and tagged Java ME, LG, Samsung, touchscreen, Virtual Keypad by Dennis Bournique. Bookmark the permalink. I don’t understand. What’s blocked and by who? Sir I deleted opera mini 8.but download is not possible it shows ‘chain does not exists’. please upload it without virtual keypad. thank you for the opera mini! you helped me alot. can you make me games without keypad? i have no pc. please? sir please upload opera mini 8.0 java version(language BENGALI) for samsung without virtual keypad. sir. I have samsung wave y s5380k. I have downloaded opera mini 6.5 from samsungapps but with overlapping letters and images.I complained developers through email.no reply. Please suggest me how to solve the problem. Use the Java versions of Opera Mini on this page. They work on Bada phones and don’t have the fonts issue. 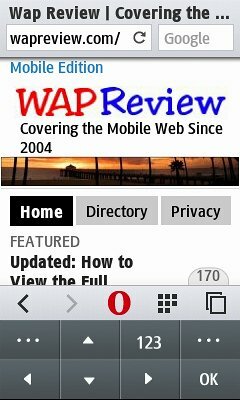 The Bada version of Opera Mini has been broken for over a year and seems to have been abandoned. I appreciate the Wapreview post and offer kudos to RogerD for sharing the solution for the LG840g. Use Opera Mini 4.5, it’s smaller. I don’t have the Opera Mini source code. Opera Mini is a closed source product, Opera does not provide source code. Yay! Opera MIni 8.0 finally installed on my LG840G with mini8t.jad. Would not sideload giving an “invalid descriptor” error, but worked fine directly downloaded to the phone. Was treated as an upgrade,and saved my bookmarks from 7.1. The URL http://is.gd/mini8t was rejected as invalid in the phone’s browser, but http://wapreview.com/dwnld/mini8t.jad worked. I had installed opera mini 8 with your URL.I factory resetted my phone and it shows- “certificate error.chain does not exist”.what to do. Try installing Opera Mini 8 again. The signing certificate had expired. I replaced the Opera Mini 8 and 4.5 downloads with fresh copies that have current certificates. Hi–A few months ago I downloaded both Opera Mini 4.5 and 7.1 for my LG840G from your site (the ones with the virtual keyboard removed). Works great! However, I am trying to do the same for my husband’s phone (also an LG840g) and no matter what different method I try, it keeps giving me the message “Authentication Failed” for both versions, though I followed the same steps as I did before. Can you help me? Thx! It looks like the certificates have expired for all the Opera Mini versions I’ve modified. This is perplexing as certificates are generally valid for a year or more and the Opera Mini 4.5 and 8 files are less than a year old. When I get some time I’ll try modifying a 8 and 4.5 again but I suspect Opera is deliberately invalidating the certificates to discourage people from downloading Opera Mini from unofficial sources. In the meantime you can download Mini from Opera and modifying it yourself following the instructions in the post. Have been unable to install Opera Mini 8.0 on my LG840G. Have used the JAD file listed here downloaded directly to phone. Have also used the JAD/JAR files from boostapps.com downloaded to a PC and sideloaded by USB to the phone’s SD card in the correct folder. Activating either JAD file in the phone get’s an “Authorization Failure” error. I did install 7.1 successfully many months ago using sideloading. Authorization Failure” errors can occur when installing a signed app if the phone’s date and time are incorrect or the phone isn’t active on the network. The Opera Mini files on this site are signed. 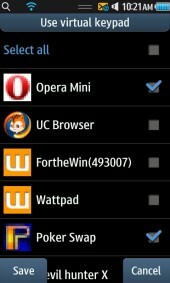 The Opera Mini apps on Boostapps are unsigned. You will get an Authorization error if you try to replace a signed version of Opera Mini with an unsigned one. Uninstalling the old signed Opera Mini should allow you to install the unsigned one. Thanks for the tips on installing 8.0, but none seem to apply to my “Authorization Failure” error. Date/time are correct, and there is network access. The 7.1 version already installed (and working) is signed, and came from this source. Unsigned Java apps are a problem, and I would not want to install one. I could remove the 7.1 version in hopes it is interfering with the 8.0 installation, but fear not being able to re-install it if things don’t work out. Here’s something you can try. On http://m.opera.com Opera Mini 8.0 is available in three signed versions: All Certificates, Thawte and Verisign. The modified Opera Mini 8 on this page is the Verisign one. You could try the Thawte version and if it works modify it to remove the key pad, or let me know and I’ll do it. I have an LG 840G and get “Authentication Failed” errors when trying to download from ANY of the above links. Downloading directly from the Opera mini site works, but I of course get that annoying JAVA keypad. Any suggestions as to my issue? Thank you for this post. If only I had seen it before I modified the Opera Mini 8 .jar myself, and saved some work – but it is useful to know how to do it. It is great that Opera are still developing Mini for basic Java featurephones. I had come to believe that UC Browser was the only actively supported browser. I think wapreview is the best site . why cAnt opera mini 8 for java phoNe work oN my samsung champ GT-3303i, it says “java erRor!”. . .
please reply fast. . what should i do? ? ? Try downloading it from Opera at http://m.opera.com using your phone’s browser. I have a Pantech Renue (P6030), and the modified versions dont work for me. Are there different commands I need to put in the file for it to remove the keypad? I don’t of any other commands for disabling the keypad. This question is for Michael Saddin. 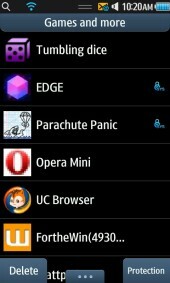 Are you saying that you were actually able to get Opera Mini to work on the Pantech Renue? I thought this phone wasn’t even capable of using Java apps! Please reply to let me know if you actually got Opera Mini to work at all, and then I will try to modify the file to remove the onscreen keypad! I’m assuming that the only way you got Java apps to work on this phone is to download them through the default browser. Am I right? I found out how to remove the virtual keypad from Opera Mini for the Pantech Renue! That line worked for me. Opera Mini takes up the whole screen now. I used Opera Mini 4.5. This phone doesn’t have enough power to run Opera Mini 8. 1. For this phone, you should NOT download the version that says “All Certificates”. You should download the one that only has the “Verisign” certificate. When I downloaded the one with all certificates, it still made me press “Accept” whenever I clicked on a link. But using the one that only has the Verisign certificate is better. It only asked me to press “Accept” twice when I first installed Opera Mini, and then I no longer had to accept each loading page anymore! 2. You should go into settings and scroll to the bottom. There’s a setting called “Protocol”. The default setting is “Socket/HTTP” and it makes the pages load too slowly, so I changed it to only use the “HTTP” setting and it made the pages load much faster. Other people who use phones from AT&T should put that option into their “Jad” files when nothing else works. I have an LG 840G and can’t get the keypad to disappear on 7.1 when downloaded from this page, but 4.5 has no keypad. Any toughts? Opera Mini 4.5 and 7.1 both contain the same modifications so if one works the other one should too. However some readers have reported trouble downloading files fro Dropbox where 7.1 was posted.